The 2020 Kia Soul EV was given a 243-mile range rating by the EPA, slightly besting Kia’s own Niro EV in range. Kia is skipping a year and unveiling its 2020 Soul EV at the 2018 LA Auto Show. It is a stunner. Kia is still working on its all-electric vehicle strategy and all they have to show for the meantime is a compliance car: the Kia Soul EV. We reviewed the 2017 version of the vehicle last year and we were pleasantly surprised for what is basically a gas-powered vehicle modified to fit an electric motor and battery pack in order to comply with zero-emission mandates. If you want a minivan and don’t want to burn fossil fuels to get around, your options are extremely limited currently. You could obviously buy a very expensive Tesla Model X which ticks off a lot of the minivan features and adds a bunch of sports sedan goodies. But that sticker price of $75K is going to eliminate a broad swath of the population. From there, your options are all but nothing. You could squeeze into a Kia Soul EV which seats 5 and is a little higher off the ground than a typical car but at this point, you’d be better served to (head to the West Coast) and buy a Chevy Bolt with its 238-mile range. This is where the Chrysler Pacifica steps in. 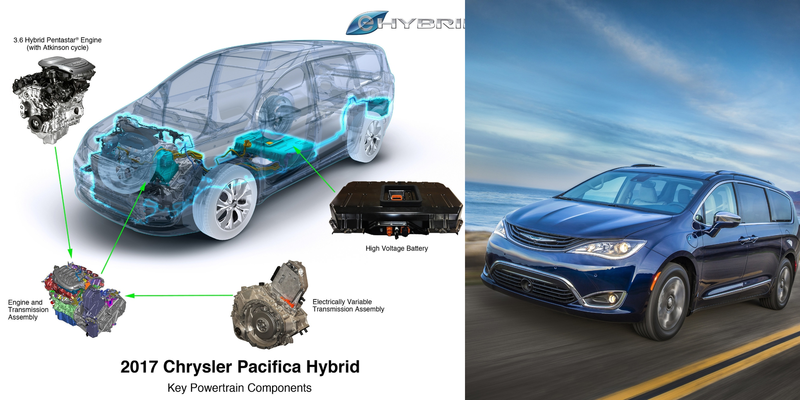 Introduced almost a year ago from the inventor of the minivan comes a Plug-in Hybrid version of the popular Pacifica high end mini-van. This hybrid was touted as having 30 miles of range on electric only before its 500+ mile range with ICE kicked in. It has been a few months since our last in depth EV review with the 2016 Chevy Volt so we’re excited to jump into another in-depth review: The 2016 Kia Soul EV. I got the Soul EV yesterday driven from New Jersey about 52 miles away. With most other sub-100 mile commuter EVs this would mean it was pretty much useless to me upon delivery before charging. But the Kia Soul has a 115 mile city range (93 on the highway), the biggest non-Tesla range currently available in the US, so I had about 60 miles to play with. Kia announced today that it will introduce the Soul EV in 4 more US states: New York, New Jersey, Connecticut, and Maryland. 19 new Kia dealers will be certified to sell and service the Soul EV, which will now be available in 10 states. The car was already available in California since late last year and in Georgia, Texas, Oregon, Washington and Hawaii since earlier this year.